Panasonic, is an established Japanese brand which would turn 100, next year. A small company which started its business as a bulb socket manufacturer has grown into conglomerate employing over two lakhs of employees across the globe. Panasonic is the largest consumer electronics manufacturer from Japan, a country known for quality. Panasonic offers the complete gamut of washing machines—from semi-automatic to fully automatic, from top loaders to front loaders. It is a safer option for those who want to try premium features of the washing machine at an affordable price point. Panasonic is much more reliable brand when compared to many new local players. ActiveFoam wash is a result of years of research and hard work of the Japanese tech company Panasonic. What it does is, from the very beginning of the wash cycle it makes the drum rotate with the maximum speed so that the detergent is completely dissolved with the water. A concentrated shower of water is then directed on the loaded laundry which penetrates foam deep into the garment’s fiber in order to pluck out adamant dirt. ActiveFoam wash found in new series of automatic washers offers a neat and clean wash with a shorten wash cycle. Low-end semi-automatic machines don’t have ActiveFoam technology but as an alternative use Aqua Shower Rinse. Powerful shower of water is streamed out from the center of the tub, meanwhile, there is continuous drainage of dirty water. This helps in delivering hygienic and detergent-free wash even in semi-automatic Panasonic machines. There is always a fear of washing delicate laundry elements like lingerie, lace, satin, scarf etc in the washing machine. Most of us generally prefer to hand wash these delicate items. But thanks to Gentle Hand Wash technology, you can wash these delicacies in the washer itself without apprehensions. Just putting clothes on the “Gentle Hand Wash Net” in the tub ensures careful and gentle cleaning. Main USP of this technology is that clothes don’t directly touch the pulsator or rub against each other. 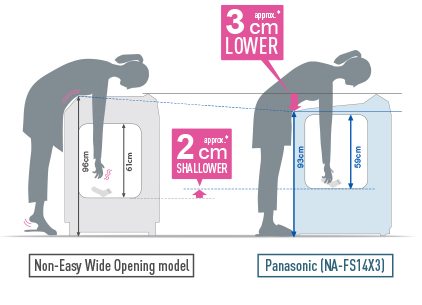 This averts delicate clothes from depreciation during the wash.
A new generation of front loaders from Panasonic is powered with AquaBeat technology. This is 3-way washboard lift mechanism which optimizes the washing performance in order to conserve water, energy and time. The strong 3-beat water flow mechanism completely removes stains from the fibers while the powerful AquaBeat action deters the dirt from sticking back to clothes. Toss wash: Imparts massaging effect through lite toss-like movement inside the drum. As a trimmed down alternative to AquaBeat, semi-automatic machines from Panasonic comes with 3 wash programs: regular, gentle and strong. Modern high-end front loaders from Panasonic comes with an ergonomically designed rear control panel with electrostatic touch. This arrangement mitigates pressure on the neck, because control panel is now angled to be within the operator’s line of vision. Moreover, its designed to enable use even when the lid door is open. Stylish electrostatic touch panel comes with direct course selection buttons with vivid pictograms. To the user’s delight, they are back-lit too. It gives out a beep sound on each button press so the operator can know his/her selection is registered. Since the modern top loaders equipped with a rear control panel which doesn’t block the opening, the opening is now made wider making it easier to load large items like a blanket. Also, it ensures good visibility even at the bottom because the opening isn’t eclipsed by the control panel. So, even smaller laundry items like socks and undergarments aren’t overlooked. Taking cues from top loader counterparts, new front loaders from Panasonic also comes with Wide Drum Inlet. It comes with a unique wide opening door making it easier to stuff larger clothes like bed sheets inside the machine. Not only this, it also has huge glass door of the drum in front, so the user can clearly watch the washing process. This glass door is double-glazed to trim down the noise level occurring out of operation. New Panasonic semi-automatic machines come with durable poly propylene body which is robustly designed to be rust-proof. Also, they are equipped with castor wheels which impart portability to the washer. Castor wheels are made up of good quality plastic, capable enough to handle the heavy load of the appliance. New class of top loaders from Panasonic comes Dual Pulsator which imparts multi-directional dancing water flow to deliver a thorough cleaning. While the modern front loaders come with brushless digital inverter motor with the 3D sensor. This powerful combination analyzes the drum movement in each dimension with high precision to adjust the speed of the motor in accordance with the load for optimum performance. Power cuts and voltage fluctuations are common across household in India. Panasonic’s elite washers come with Voltage Control technology to tackle this problem. This feature protects the machines from spikes in the supply. Also, it safeguards machine from under voltage by stabilizing the supply voltage so that machine don’t get damaged. Moreover, they come with Auto Restart feature, which makes sure that in case of power cut, the machine will resume the washing cycle from where it stopped. So, users don’t have to worry about the complete wash cycle getting repeated in case of power cuts. Though Panasonic is a trusted brand but it still doesn’t easily feature into the premium brand’s list of experts. So, let’s see what are the benefits and compromises of owning a Panasonic washer. One of the main USP of Panasonic washers is they are energy efficient. It’s evident from the fact that premium front loaders from Panasonic come with A+++ Energy Saving rating as per European standard. They also come with an eco-saving mode which consumes nearly half the amount of water and energy compared to the ordinary wash cycle. Though it takes a little longer for a wash to complete. But again, the good thing is that new breed of premium washers also comes with delay start functionality so that users can schedule this eco wash at night. Their washing performance is decent enough and can remove a variety of stains. But when it comes to oily stains it lags behind in the cleaning results. Another good thing is that modern front loaders come with 15 min quick wash option to clean lightly soiled clothes in a jiffy. But then the downside is that it would take a longer time to dry the washed clothes. Panasonic is a trusted Japanese brand in consumer appliances segment. Panasonic machines offer a variety of wash options and programs so that users can customize their wash according to their convenience. Panasonic has been innovative and useful by coming with rear mounted panel design and easy wide opening arrangement. Also, all Panasonic washing machines go through rigorous testing to ensure the preset quality standards are met. This test includes: drop test, lid-strength test, mock finger test etc. Thus, buyers can be assured of reliability and quality of Panasonic’s machines.